Wayki Wayki Blog: Serpent Cult Symbolism ?S? 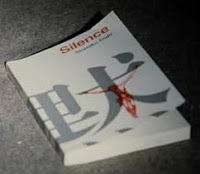 information, awareness, debate, clique, humour, love, craziness, and, in some cases, the hunt for money and profiteering. Within all this I found the Mathew Dalooze articles at oneballmedia interesting; referring to the con men of conspiracy looking to make money, and other articles looking at the serpent cult that possibly sits above and within the illuminati (mentioned and explained in wayki wayki). As a sidenote, for me, all of the "conspiracy/alternative media/truth" heavy weights that still live in England or the US need to be questioned for their location alone - but that's just my opinion and too long an article for the now. I mean how can one put the bins out on a thurday, pay for a ticket at the carpark, pay council tax, get their car insured, lock their front door and then preach they are ambassadors of freedom and awareness? It doesn't fit on so many levels. After reading some of Dalooze's recent articles on the serpent cult and relevant symbolism, I decided to leave the subject alone, but then someone gave me a DVD of some films with spanish subbies (porque apprendieno espanol ahora). Out of these 6 films I clicked on one "randomly" (not that random exists) and up popped "The Lazarus Project," a film I had never heard of, or seen before. After viewing I was like.....hmMMmm, and scanned the film again to confirm what I saw....yep, this is worth sharing and there is a strong link in symbolism to the serpent cult symbolism. The Film shows Ben, a man that loves his family and his "brewing" job, but gets caught doing a supposedly simple robbery to help support his wife when he loses his job. 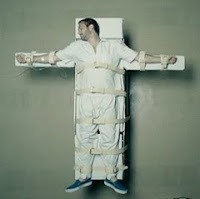 As he is in texas he ends up being executed by lethal injection!! 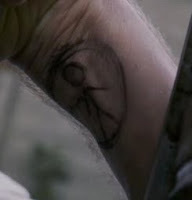 He is injected in the wrist and dies on a cross, he also has some wierd tattoo on his wrist I cannot make out. He wakes up and finds out he has been given a second chance at life, he is miles away from home and working as a groundsman of a mental asylum with his own cabin in a nearby forest. He is told by X that he cannot leave or death will find him, and one time he tries to leave on a bus X comes on and tells him death is near, he gets off and the next day the paper says the bus crashed and all passengers died. During and around this, Ben has a pet dog, a couple of dates with a local psyciatrist, has some small hallucinations of demons, keeps seeing a symbol of a man in a circle, and starts to feel he is being watched. An actual patient in the asylum tells Ben they are "the same," then kills himself. 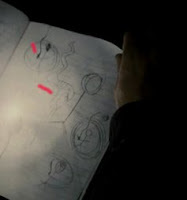 Ben is intrigued and looks thro the dead mans room and finds a notepad with lots of pictures of serpents biting the wrist. At this point, as happened once earlier in the film, Ben has flashbacks (really really quick) that show the time after his "death" and both times we see an actual snake at his wrist. This is sooo quick it is hard to see. VLC slow motion is needed, it is only 1 or 2 frames....and the eye works at about 12 a second. Ben misses his family soo much that he decides to leave, but he gets caught leaving and wakes up in the asylum as a patient. He is told he never lived in cabin, the dates and dog did not exist and that HE killed his family. He is plied with drugs and told he made the dog, robbery story etc to deal with the pain. He is now as the person who killed himself, "the same." He thinks he is crazy and that he killed his family. He soon sees a frisbee up a tree that he had with the dog, then he finds the dog in a nearby pound and also finds a drawing he did in the cabin he sopposedly did not live at. He has now worked out he has been lied to, his family are alive, the news of the bus was forged, there were cameras in his cabin, and he knows he is in a mind control experiement induced by a .....'S'elegene implant in the wrist. He takes it out. He confronts the ppl in charge of the "mind control experiment" in their super tech big brother control room and tells them they lied to him and he is leaving to see his family. As he has the files on a USB of what they are doing they have to let him leave or he will blow the lid on the project. Before Ben leaves, the man in charge says "We are fixing people, it's all in the head, all in the mind, we are providing people with lives and environments, it all starts in the mind, what ppl do, what they do, why they do it. What if we could fix human beings." Ben goes home, greets his family, and the last scene of the film shows the daughter, hugging a serpent but is asleep.....possibly much like humanity. 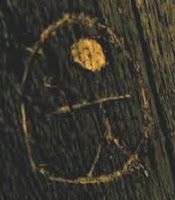 Let us look at some other symbolism in the film, upside down cross, non relevant pictures of demons, the number 5 is seen throughout the film and once on red (gevurah from qabbalah = destruction and severity when qlippotic), and for no reason at all, Greg Braddons book which explains much about the truth of reality and the split second showing of a book called silence showing death on a cross (which links to alchemy, osiris and jesus - the death of the soul via silence). The credits also show the film is in association with Scion films. Symbolism is deeper that the dollar bill, and the levels of manipulation are at a level of consciousness much different and higher that that of the collective norm. The film shows people in Mind Control Experiments created by tampering with the wrist. Many quick flashes within the film show serpents attached to, or biting the wrist. We KNOW that the illiminati control much of the planet via mind control (see architects of control or century of self online or read waykiwayki)....is there a serpent cult above and within the illuminati? It cannot be ruled out, there is so much symbolism everywhere if you look deepy enough and know what to look for. This all links to the recent Dalooze article Is there anybody there? dumbed down in the spirit world, but you would need to read that and watch the film to fully understand these links. Now the big question in ALL of this article is this, does your mind create what you focus on, or is there a spiral of syncronisities and symbolism thrown at you that you cannot see unless you know what to look for......the answer is, as the Hermetic Philosophy states in The Kybalion; "both are true, its a half truth." But as we clearly showed in wayki wayki, illuminati symbolism IS used in films, this is a fact. Note: I have not searched the net to see if anyone else has ever covered the symbolism in this film before. Pretty much because it would make no difference to what I saw, or how the film "came" to me randomly a day after reading Dalooze. wow interesting article - I get the RSS feed from your site. Just want to tell you something about that Delooze "dumbed down" weblink (he doesn't mention this). 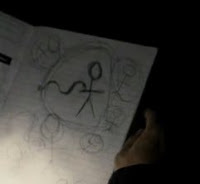 Where you see his "hand drawn" illustration of that serpent circle. I recolonise this as "borrowed" from Hindu / Vedic cosmology. Inc the likes of Richard L. Thompson (RIP 2008 drowned), Michael A. Cremo (co-authors of Forbidden Archeology). ps hope my comments were not to long.